The Summer Shakespeare this year is 'A Midsummer Night's Dream', directed by Karen Carleton and presented around mid-summer in the gardens of St Enda's Park, Rathfarnham. Shakespeare’s comic fantasy of four lovers who find themselves bewitched by fairies is one of the Bard's most loved plays. In it he turns his attention to love, jealousy and marriage with great comic effect. The next auditions will be held on Wednesday evening 27 March 2019 in the dlr Mill Theatre Studio. See the Members Area for full details. 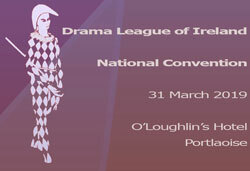 The 2019 National Convention of the Drama League of Ireland will be held in O’Loughlin’s Hotel, Portlaoise on Sunday 31 March from 2pm to 5pm. Registration is at 1:30pm. The DLI Board would like all members to attend the meeting to hear reports on the past year and to help plan for the future. In addition, a number of positions require to be filled on the Board of Directors for the coming year. Three scenes from the show photographed during the dress rehearsal. 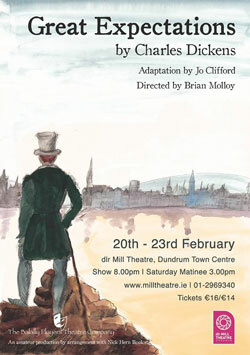 In February (20-23), at dlr Mill Theatre, Dundrum, Balally Players presented one of Charles Dickens’ best-loved tales brought thrillingly to life and given a fresh spin. Directed by Brian Molloy, 'Great Expectations' follows the tumultuous yet uplifting adventures of the orphan, Pip. Balally Players brings this Charles Dickens story to the main stage of the dlr Mill Theatre from 20 to 23 February 2019. This production for Balally Players, a stage adaptation written by Jo Clifford, was directed by Brian Molloy and was on stage in the dlr Mill Theatre from Wednesday 20 to Saturday 23 February 2019. In addition to the evening shows, there was a Saturday Matinee at 3pm. The performances were supported by dlr County Council. For more, see the What's On page. 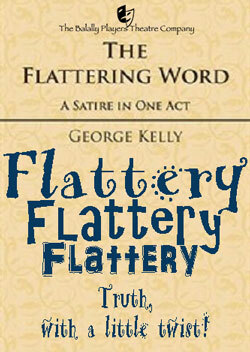 'The Flattering Word' explores the funny power of flattery to bend and twist its way around a grain of truth! The Flattering Word, written by George Kelly and directed for Balally Players by Aisling Uí Laoire, is a one-act comedy, written in the 1920s, that tells the story of a celebrated actor, Eugene Tesh, who pays an unexpected visit to an old friend. During the course of his visit, he uses his charm to eradicate the other character’s prejudice against theatre, convincing them that they in fact have an unrealised talent for the stage. What ensues are some very funny moments of attempting to realise one’s secret desire to make the big time! The Flattering Word was in the Glenealy One Act Festival on Sunday 20 January 2019 and in Co Wicklow for the Bray One Act Festival on Wednesday 23 January 2019. 'Paris to Picton', written and directed by Pat McCarry will be presented from 24 to 27 April 2019 in the dlr Mill Theatre Studio, Dundrum, Dublin. This year's 'Summer Shakespeare' will be 'A Midsummer Night’s Dream' directed by Karen Carleton and presented towards the end of June, outdoors, in St. Enda’s Park, Rathfarnham, Dublin. More details will be posted here closer to the performance dates. This search facility will find references to plays, people or anything else within the pages of this website. It's great for searching past performances, newsletters or text witin PDF files anywhere on our website. The site is re-indexed weekly. You may also use Google to find items on this website. However, it may not include more recent entries if they were posted since the last time that Google scanned and indexed the site. during the year for details about recent and forthcoming productions from Balally Players and other groups. Visit What's On page for more. You can enter text above or use the Google Custom Search box at the end of this page to find references to plays, people or anything else within the pages of this website. You can follow us on Facebook, connect with our page through the 'Like' button in Facebook, or share this site with your Facebook friends. To follow us on Twitter, click the button below. To get information about Balally Players events automatically, add your email address to our mailing list. Information about our mailing list and our Privacy Statement is on the Contact page. In common with most websites, we use small text files ('cookies') saved on your computer or mobile device to enable some of the features on the site and make it work better over time. Our assumption is that by viewing this website with internet browser software set to accept cookies, that setting reflects your acceptance of our use of such files.